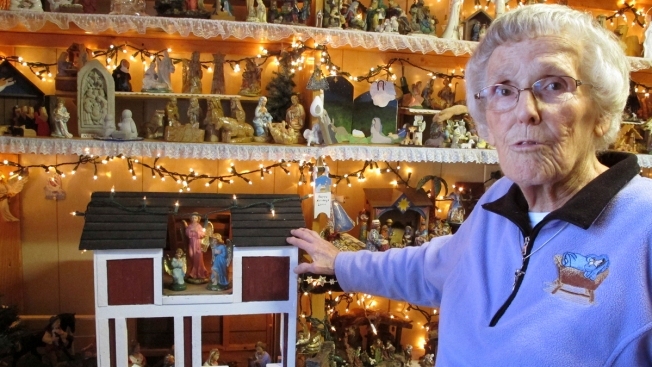 In this Wednesday, Dec. 20, 2017 photo Shirley Squires, of Guilford, Vt., speaks with a reporter about her collection of more than 1,400 nativity scenes on display in her home. Each Christmas, she gets help putting up the miniature scenes and then opens her home to school groups and others for viewing. 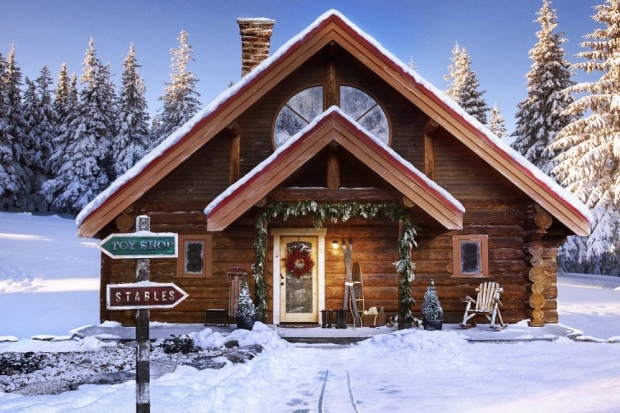 Each December, Shirley Squires transforms her modest Vermont home into a veritable creche museum, with more than 1,400 miniature nativity scenes of Jesus, Mary and Joseph covering every surface, taking over two bedrooms and overflowing into a specially built room in her garage. During the holiday season and through January, the 87-year-old welcomes school and church groups and other visitors by appointment to tour her collection lit up by holiday lights. "This is my 20th year of doing it," said Squires as she sat in a room surrounded by nativity scenes some from faraway places like South America and Africa and others from nearby thrift stores. "It's a lot of work, but it's worth the work when I see all the pleasure that the people (get) that come to see them." Squires started collecting them after the deaths of her husband, in 1991, and her son, in 1993, both around Christmastime, "to get through the first couple of years," she said. She opened it to the public in 1997, and gets about 300 visitors a year. The collection grew as people gave her more, and she and her family purchased some as well. The hundreds of scenes displayed on shelves, in cabinets and on and underneath tables come from more than 55 countries, by her count. Some are crafted from wood, porcelain, plastic or clay. Other specially made versions include one crafted from wood shavings, another from beeswax. There's even a Jesus, Mary and Joseph in the manger in a sandwich bun. They range in size from one about as small as a thimble to one with a waist-high Joseph and Mary at the top of her stairs near the entrance to a bedroom, where a sprawling set of small figurines from Italy cover an entire bed and several shelves. She admits it's a lot of work and wonders if she'll do it again next year. She starts setting the collection up in September, with help from family. She keeps the display in the garage room up all year and no longer takes down the collections in the upstairs bedrooms. "I've always been a religious person, and the birth of Jesus is really the meaning of Christmas and the whole meaning of what Jesus is all about," she said.